Our example of Rouault’s art is a page from a rather happy suite, dealing with the famous French circus “The Shooting Star,” which has provided inspiration to other artists too. 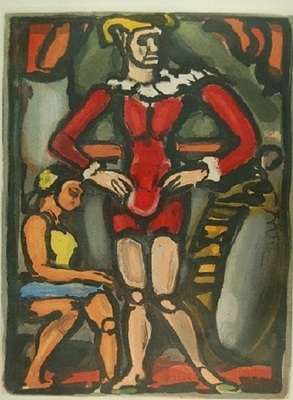 Rouault’s vision of it is that of a series of clowns and acrobats boldly facing the public almost like saints in a gothic church. He worked on it for many years, before it was published by the well-known art dealer Ambroise Vollard in 1938, an edition of 250. Master Arthur is a magician of immense grace and gravity. It is signed on the plate, as the suite would be signed by hand. Vollard expected the suite to be sold as a whole, but our Master Arthur made its way to Southern Miss alone.